The samples shown in the picture are from the upcoming Nursery Block sweater. 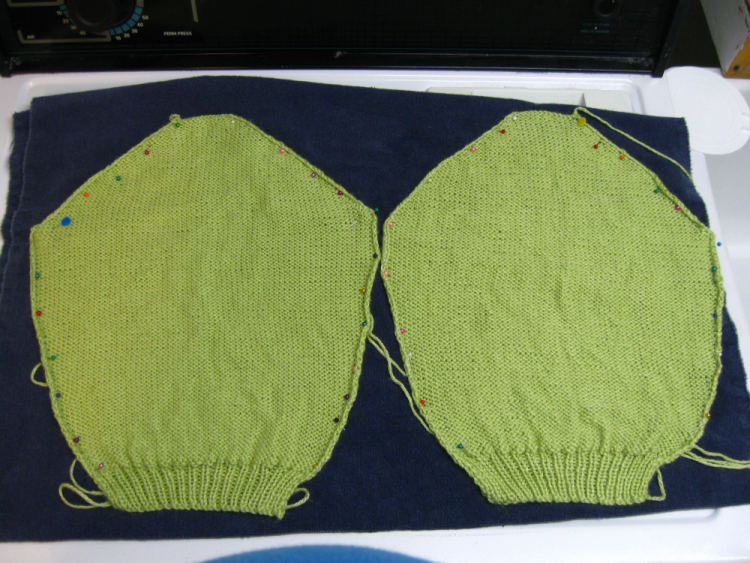 The two sleeves were knit with different needles but both were same size (3.75mm). Why did the left sleeve turn out to tension and the right one bigger and sloppier to boot? Clearly the type of needle being used makes a difference. So many to choose from – so much cash that can be sunk in needles. Before you even get to the yarn for the project! What to do? If you read the major knitting magazines you will find at least one article every year analyzing all the various needles types or promoting the latest and greatest. Needle choice is important. After all it’s your primary tool. You want your needles to feel good in your hands but also produce good results. I’ve been through my share of needles – I have a cardboard box full of them. Some of them I wouldn’t part with ever. Those would be the razor-sharp English size steel 11s that my granny probably used to teach me to knit. But I can’t remember the last time I used them as they are awful to work with. Choose slick, slippery needles for back and forth knitting or knitting large circular projects. These will give you the best speed and produce an even result. My favourites are casein if you can find them, plastic or nickel-plated if not. Nickel-plated are really nice because they warm up quickly in your hands. Choose sticky double-pointed needles made from wood or plastic for close in circular work like socks and mitts. My favourites are made of either birch or bamboo. You don’t want the needles slipping out of the project – that trumps speed here. Choose a convex, semi sharp tip. My experience with these is that they split the yarn less than sharp tips. Always knit a tension square with the exact needles you will be using for your project or you will risk getting results like the picture above. The actual choice of needles is yours to make. Friends or partners can support your work by choosing from your wish list to help you out. All of my favourite needles were bought by my husband as gifts. That’s pretty cool!